John Key and Nick Smith have taken in recent weeks to trumpeting Auckland's current building boom as the biggest in New Zealand history. Keen to show that something is being done to deal with a shortage of 40,000 homes in a city that has grown by 163,500 people since it was elected in 2008, the Government is exaggerating the scale of what is happening. Yes, total spending on construction in Auckland in 2015 was a record-high NZ$10.9 billion and is forecast to rise to NZ$18 billion by 2018 in the most recent Government forecasts. But that total includes the building of offices, motorways, tunnels, hospitals and schools. The 9,651 houses consented in the last year remains below the 12,937 consented in 2004. More importantly, it was also far less than the 12,941 homes consented in 1974 when Auckland's population was just half its current size. Statistics New Zealand has published an analysis of consents showing that the number of consents per 1,000 people has risen nationwide to 6.3 in the last year from a record low 3.1 in 2011, but remains below the 13.1 per thousand reached nation-wide in 1974. The numbers for Auckland are even more stark. Auckland's consents are currently no higher than the national average and are below the 16 per thousand people reached in 1974. Auckland is now building houses at significantly less the half the rate it was in 1974. However, by exaggerating the scale of Auckland's current building boom, the Government has highlighted the enormous task ahead and hinted at potential solutions. It begs the question: what were we doing in 1974 that we're now not doing? Firstly, the Government was building and financing lots of smaller and much more affordable homes on a much bigger scale. The 1972-75 Kirk Labour Government was in the middle of a big ramping up of state house building and first home buyers were able to borrow money from the State Advances Corporation at relatively cheap rates to buy brand new homes from private developers and builders. Young families were also able to capitalise their future family benefit payments to help come up with a deposit. But those Government loans were only available to buy simple and Government-approved designs under the Group Builders Scheme. Under this scheme, the designs and the buildings were checked and approved by the Government and private builders and developers were given a guarantee that if a home was not sold that the Government would buy it. This meant that the houses built were relatively small (80-100 square metres) and therefore relatively cheap to build. Developers and builders could plan for larger scale developments and had less risk of being stuck with a home they could not sell, so they went ahead and built a lot more. Fast forward to 2016 and now most new homes are enormous (over 200 square metres) and expensive, and built in dribs and drabs by small builders. An analysis by Homes.co.nz found that almost half of the new builds in Auckland over the last five years were sold for more than NZ$1.2 million. The one and two bedroom homes with 80-120 square metre floor plans that first home buyers want are only rarely being built. PrefabNZ CEO Pamela Bell said the size and cost of new houses is now driven by developers looking to maximise profit margins at the lowest risk from their sections, which means building for the top end of the market on expensive sections. Along with often restrictive covenants requiring large floor plans, the market has moved to mostly building big houses with as almost many bathrooms as bedrooms, she said. "It's supply driven by developers looking to make the most of their land," Bell said. "We need more really savvy developers, or we need a dictator with a chequebook to provide more affordable, low rise medium density homes that are more saleable," she said. "We need less bathrooms than bedrooms and to return to those 1970s ideals." Somehow, the Government needs to step up and provide the backing for a 1974-style boom in the building of small, affordable homes at a massive scale. The Government itself may not need to build all of them, but guarantees of repurchase and low deposit loans for first home buyers would help unleash the market for these homes. History has shown the market won't provide them on its own. A version of this article also appears in the Herald on Sunday. It is here with permission. Private developers aren't interested in anything cheap, they only do high margin builds. For anything else, we need a government with vision and initiative. Not one that does not even acknowledge there is a crisis. Meanwhile John Key continues to say the "Free Market" will solve it all. lol. Only one answer for that #JKexit. And anyone else see the article yesterday about NZ First policies on student loans? They are lining up their policies with that of Lab/Greens. As a millennial, I don't even want a house bigger than 100sqm. Private developers do not make huge margins on builds. I would be very surprised if their expected margin is over 10% from the outset. If it were the case, we would have an abundance of development interest and no land banking issues. The free market would solve this issue. I firmly believe that (in the Chicago rhetoric) that if all superfluous taxation was removed from the market, supply would catch up within 3-5 years. The problem you mention is not with free market economics, but instead with an artificial market, which is what we have. On the topic of Chicago economics, the student loan policy is just another middle class vote grab not overly dissimilar to what JK has initiated with middle class (nominal) wealth. These aren't policies for everyone; they are policies for enriching the middle class - the voting base. Oh to have a Keynes v Hayek/Friedman debate on this..
Add to that a tax shift that encourages all investors to accept a realistic price that allows first time buyers to compete. Yes that means a PRICE DROP! Get out or take the rap. You're right. First you must actually implement a tax. How are more taxes going to help? The issue lies in the fact that we already have too much (effective) taxation.. Your'e taking the mickey right? Housing is a basic human need at not something even the most rabid capitalists leave to the "free market", How much of the New York rental market is rent controlled? True, lots of New York apartments are rent controlled. It's the same in many European cities. The key word being 'apartments', though..
Tell me though, what is the proportion of Aucklanders living in apartments? Apartments are more suited to price controls than free standing houses, due to their comparative lack of systematic variation. There would be no equitable way to implement this in the case of Auckland free standing properties - where the issues lie. So, suggesting that is a tad hypocritical if the basis of your argument is equitable rights? "...not something even the most rabid capitalists leave to the "free market""
A pure capitalist - I'm guessing what you mean by "rabid" - would most definitely argue to not have any interference in the housing market. I agree, the housing issue is a huge problem but the way in which most people propose to fix it is mainly just cherry picking solutions, with little understanding of the mechanics and larger implications. Rent controls are not the answer, unless we shift the dynamic of housing to apartment living. And as 60+ BB on my own neither do I......I don't like the legal set up of the 'retirement villages', but looking ahead would like the smaller footprint and compatible closeness of others.....of any age. Cute cottages Anne, I'm sure there will be builders in your area that could do you one like that. Won't be cheap but a competent architectural draftsman should be able to adapt these so they are more cost effective and better suited for NZ needs. They look to have been designed for a flood prone area which would add to costs. They remind me a bit of our small cottages from a hundred years ago - railway and farm cottages, small villas that sort of thing. There was a lot architecture here based on or similar to North American stuff at that time. Good luck with it. Acacia Cottage in Cornwall Park, Auckland, is nice. You'd just have to find a plot where there isn't a covenant forcing you to build a McMansion or nothing. 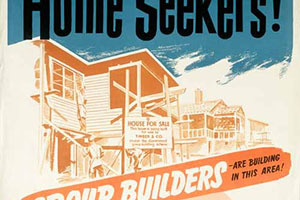 Interesting they mention the Sears and Roebuck 'Craftsman' houses. Those came in great designs, could be put together by reasonably skilled amateurs with basic tools, and are still going strong in much more extreme conditions than NZ can dish out. Why can't we manage something similar? The ones featured on this page of Marianne Cusato's site are called the Katrina Cottages......guess why. After the cyclone which devastated New Orleans and environs, she and many other architects designed some really interesting and more importantly appropriate designs for the area to GET THE PEOPLE HOUSED. Also like the Pocket Neighbourhood concept of Ross Chapin: less land area used, building a humanly comfortable sized enclave. Jkhn Key has been very succesful for ones success is determibe by the goals that he sets for himself and if the target is reached. John Key has achieved his target of turning Auckland into a million dollar city and now his next target is 2 million dollar. Question is do we need leaders with a vision for society or businessmen that too people who enjoys and like speculative atmosphere like forex market. Auckland has been turned into a forex arena for rich and overseas friends of our PM ( must be getting browny points from them after achieving each feat and manipulating data to suit his lie and denial to protect and support his friends). Give him another term and will be sucesful in turning full NZ into speculative arena and in process sell entire NZ to foreigners in no time as people do not realise that NZ is not as big as Australia or Canada ( Though even they have identify foreign buyer as an issue and have introduced tax of foreigners). Have been a national voter but shame now for my action as national in their ego and arrogance are above any shame or honour. Election will not only boot them out but will be by humilating number. I hope you are right but I don't think so. Demographics due to the massive immigration numbers will ensure John Key will win another term. This country is finished for young people. Got 140k (and growing by 5k a month) combined with my GF as a deposit and we cannot find anything decent. And then you sign up yourself for massive debt, for nothing. You should be able to get into Papatoetoe or the surrounding areas with that deposit perhaps? 1) If you're looking for a decent house with good outdoor regardless of area, you should still be able to afford South Auckland & West Auckland for around $1.5m for a standard 3-bed 2-bath 1-living. 2) If you're looking for a do-up in a decent central suburb within 5-6 km from the CBD you'll need somewhere between $1.8m to $2.5m for a standard 3-bed 2-bath 1-living. 3) If you're looking for a decent house in a decent central suburb within 5-6km from the CBD then you'll need somewhere between $2.5m to $3.5m for a standard 3-bed 2-bath 1-living. 4) If you're looking for everything decent and more than 3 bed rooms with a decent full site and single title in a decent central suburb like this one: https://www.barfoot.co.nz/577775 then you're talking about $3.5m or more. All the best with your house hunting. Dunno what on earth those first home buyers are complaining about. Bargains. Might as well take two. haha, I recognise that format. You cannot get much further with that mindset. If people who bought homes in Onehunga, Ellerslie and Mt Wellington decades ago thought the same way like you then they would not be millionaires now. Those areas were also not considered as "decent" suburbs years ago. Also note that Papatoetoe and South auckland suburbs attract a lot of professional first home buyers these days. In a few years time they will feel themselves as winners like people who bought in Onehunga a decade ago. What makes you think immigrants vote National? And now your house is worth literally double. Stop complaining. Exactly, as a solution, what a load of crap. Secondly, what makes BH think we haven't already been heading that way with our cheaper builds anyway. Since 1974, we have also had leaky home syndrome, which is starting to be repeated, plus with leaky home 2 syndrome. Plus the massive failure of skillion roofs. And it hasn't made a blind bit of difference to lowering those house prices. And the reason why?. Because any saving that is made in housing costs, whether that saving is made by building poorer quality, or cheaper input costs, these savings are capitalized into what price you pay for the land. How about we build lower priced HIGHER quality housing like they do in jurisdictions that have policies that promote less restrictive land supply policies? Dale, my understanding is that, as land prices rocket, house sizes/prices go up as well. For two reasons. First, a $600K serviced section prices out the people who might be content with a modest dwelling. Second there is a convention that the dwelling value should not be too small a percentage of the property value. If that's true all talk of building smaller, cheaper dwellings is irrelevant until land prices come down again. No? In jurisdictions where there is less restrictive land supply policies, the land will only account for 17 to 25% of the dwelling price. This is irrespective of whether it is a stand-alone dwelling or apartment. We are up to 60% of the cost of a dwelling is in the land price. THIS IS NOT NORMAL, and is a total artificial condition caused by GOVT. land supply policies. So what you describe is true, but only in a relative sense. While house and land prices are escalating at crazy rates, they are always tempered by what price the market can bear at any one time. In our type of market, price, not quality, is the main market driver. Since the price of the land was locked in at the time it was land banked, the only saving that can be made between buying the land and when and what price the dwelling will sell for, is in the size and quality of the dwelling. But here is the rub for NZ housing, in many other jurisdictions that ALSO have restrictive housing policies, and also are being pushed into smaller dwellings, the quality of their dwellings are far superior to a NZ dwelling. For example, Vancouver has the same type of housing policies as NZ and the same high unaffordable house prices, BUT a typical Canadian house is 3x structurally stronger, twice as well insulated, warmer etc. than a NZ house. We not only have one of the worlds highest house prices, and already one of the lowest quality, but Bernard wants us to go lower quality still, and JK wants us to go smaller still. We already have people living in cars on the side of the road, I expect JK will soon be suggesting that the cars they are in are too big and Bernard saying that a used Toyota is setting their sights too high and a Trabant would be more appropriate. what's wrong with skillion roofs? There is nothing wrong with them if they are designed right, but most aren't. Because they have no void space, there is no space for moisture, especially internal generated moisture, to dissipate, and this is further compounded by no vented cavity. Further, the rafter is generally one piece so is connected to the exterior cladding on the top side and to the interior lining on the bottom side, creating a thermal bridge. All in all high relative humidity and chance for rapid temperature changes. If the frame is metal then this effect is further magnified. See the link for an explanation. Essentially moisture collects in the structure of the roof and cannot escape. First you did not buy a house you paid for the land. The actual cost of the house is a small portion of the land price I have read that the average cost to build is $260000 and if that's for an average 200sqm than a smaller house should be less. I live in an old house that has a CV of $299000 in my area the houses are 6 x the average wage if they reflected the long term average it should be 3x the average wage so it's price would be $150000. It's an old uninsulated home so if I was to upgrade it to a modern house I would spend at least $100000 to $150000 on it to make it warm and comfortable. If it was a car this cost would come out of the purchase price so my house would be worth no more than $50000 but may be $0. But it's not because it is the land you are buying. If you want to make housing actually reflect the price of the house you need a comprehensive land tax with the idea of driving the cost of land towards zero. John Key briefly mentioned he could impose a 1% land tax on foreign owned land but then shut up because this would cause land values to drop. A 1% to 2% land tax would cause land to drop between 17% to 50% or more. In 75-76 I was 25 years old. I used a state advances loan to build 150 square meters. It was "Architectural" with for example double height living. My edge was that I worked in the industry - but my job was answering the phone and I was low income. We need systems that enhance young peoples ability to give it a go, rather than weigh them down. I can't tell you how disheartening I find it when the older generations that benefited from govt assistance turn around and tell the younger ones to stop complaining and do it on their own. Pure hypocrisy. At some point policy is going to have to make this country more attractive for our youth. s" there was a plethora of tax types and income taxes were astronomical........there is absolutely no benefit in any government legally stealing another persons income to redistribute a small part of it back to them in a loan or otherwise.....so stop looking over the fence the grass is not greener! Not all of us received govt assistance back then. There were criteria to meet. Just like only a few from my High School ever entertained the idea let alone attended university. Lesnakey - if you want to be taxed at 66 cents in the dollar as many were then, you to could have all the "assistance" you want - fortunately most now prefer to retain a greater share of their money and make more decisions themselves about where their money is spent. If I was desperate for a house in Auckland (and lots of people are) I would get 2 -3 others who are in the same situation, find an old 2brm house on 700m. Pull it down and put 3 100m house on 220m sections. I would seriously look at modular houses built in China and then shipped here in a container. They only require a few days to put it together on site. Forget what big daddy says. You could still build stylish and substantial Nimbo. What about a decent apartment building in combination with your mates. Govt should be assisting with advice and finance. Like what Bernard says. I'm pretty sure that bunch are all pro immigration so you would solve nothing. More of the same, full steam ahead. What a good idea by our resident expert Sir Bernard Hickey. More cheaply built, cramped, damp slums all built on hill sides made of ticky-tacky and all looking the same. Not to forget China build house. Than even John Kee will be happier as will get browny points and pat on the back when he next visit China. I have helped write some articles which I think would correct some of the housing market imperfections http://www.interest.co.nz/opinion/83082/brendon-harre-and-david-lupton-s.... Bernard makes a case for direct government involvement. I think the greater point is there are options to fix the housing crisis from the supply side which the government is not taking. Of course as many say here, there is opportunities to reduce demand by limiting/removing the effects of foreign buyers and high immigration. I think for New Zealand the housing crisis will define who we are as a people -are we a egalitarian people that gives everyone a chance in life or are we a people that allows New Zealand to be a playground where only the interests of the wealthy are considered. I made a similar point to the Homeless Inquiry. Serial Sellout John Key said that he wants NZ to be the "switzerland of the south pacific". Wealthy playground for the rich it is. Switzerland might just be a little more tightly regulated than you fondly imagine. And I'm not sure that the New Zealand financial services industry is up to the job anyway. Does wages support a million dollar house and more. John Key and his gang has totaly lost the plot. New construction will give more fodder to the fire - more stock to speculators to play. Unless any government acts nothing will help to solve the crusis except natural falll which when happens in an uncontrolled envitonment will not only be bad to the ecenomy but also socially. Leaders with vested interest do not care as they have made their fortune and who cares about the country. THIS is what absolutely must stop http://www.nzherald.co.nz/business/news/article.cfm?c_id=3&objectid=1170... now more than half of all sales to "investors". I think it is time to say, if you want an investment property, then you bloody well build one. This business of "investors" buying existing properties might "provide" a house for people rent (but I'd argue all they are doing is creating their own clientele by outbidding potential home owners), but it is absolutely depriving people of HOMES. Stop but this is the goal of John Key that is set out to achieve. To stop only solution #JKEXIT. Since so many on here are hash tagging, I wonder what it does within this comments section ? Can't see anybody hash tagging? And that's why there won't be soft landing when panic selling strikes. Just built quality apartments of around 90-100 sqm. Plenty of us millenials don't dream with massive timber houses with unecological gardens that require spraying and mowing. We'd be however more thsn happy living in centric areas where we could walk to work and where the area is not dead after 7pm. Who knows? NZ could finally have fun city life. The problem of NZ is precisely what the article suggests: looking backwards for old solutions to new problems. Thanks but no thanks, no way am I moving into apartment/s while the earth keeps shaking more often than not. Consents that try to recover the leaky building saga overhang? Not to mention onerous covenants and the need to build the garage at the same time as part of the house as the section would be too small to do otherwise. And this why some of us think that Sir BH and his supporters Speak before they Think .... it has all became a business of Attention Grabbing Titles with empty contents ... discussion for the sake of discussion !! Exactly. You prove the point. Changes that are independent of affordability are making the market much more difficult to satisfy the real demand. double glazing and insulation should be mandatory - maybe not in the far north, but Auckland and further south should definitely have both. Double glazing also helps cut down on noise coming in, and with so many people living so close to motorways, that ca only be a plus. The higher the required standard now, the longer a house will be livable, and will not need extensive renovations later on. The land cost - well, that's an issue which needs to be looked at. Building material duopoly should get busted, too. Site work demand? Can you elaborate? Do you mean health and safety? The consents are not that restrictive, the RMA is actually a very permissive piece of legislation, especially where land is concerned. The overall approach is to promote development. In order to keep consent costs down, look at what's permissible in the location you're trying to build, and stay within that. And the connection of services: blame the ones who sold off these companies that used to be publicly owned...now that they're private, it's all done for a profit, dontcha know. Something like a lockwood, especially the kitset ones, are affordable. They'll even do the consent application for you, they're decently built homes: warm and comfortable, and have a spacious feel to them. The trouble is the standards are rubbish. The minimum double glazing has alu framing which acts as a thermal bridge. Most houses have these stupid windows which grow mould on the frames. With a few coatings and gasses, as well as splitting the frame with some plastic the insulation value (R-value) doubles. Yet most houses build today have this rubbish installed because people see houses as something to flick on to the next fool rather than something to live in. NZ needs to get rid of BRANZ and allow imports of proper windows. The local window factories are rubbish. Those of you thinking National will get crushed at the next election, I would not be so sure. Don't underestimate the great selfishness of a very large chunk of nz society that would put them there again for a forth term. And with Labour again looking like just a National 'lite' party with Andrew Little shooting himself in the foot regarding comments on house prices then I don't see a great landslide victory for opposition unless half of NZ fell in love with Winnie. It MAY take a catastrophic economic reality to be realised prior to the election for any huge difference to occur. The thing about 'conservative' NZ is when the anger is not in the streets on mass to be seen then it's hard to predict anything. Those of you thinking National will get crushed at the next election, I would not be so sure. Yes indeed. It's surprising how comfortable the electorate is with glaring fascist endeavours undertaken by this national government. Tax residents aren't necessarily eligible to vote. Even citizens or permanent residents may not be eligible, if they have not been in NZ for a period of time. I guess this is what happens when National uses the LINZ foreign buyer data to try and equate tax residency to permanent residency. I got an IRD number the day I arrived (under a Labour government), I sure as hell couldn't vote until a few years later when I got permanent residency. Only citizens should be allowed to vote. Those who have made NZ their future, not those with one foot in the door and the other out. No. Paying taxes should also entitle you to vote. No taxation without representation. A basic democratic right and freedom. If you contribute to the country through your taxes, then you should have the right to vot on the future of the country. It's always alarming to see New Zealanders so enthusiastic about abandoning their hard-won democratic rights and freedoms. And sad, too. So a MNC should be allowed to vote? Temporary foreign worker should get to vote? If you want to be like the USA so much then maybe we should have our own equivalent to the 2nd amendment. I assume that by MNC you mean multi-national corporation. I am a at a loss to understand why you would want them to vote when New Zealand companies can't vote. I see no need for the pandering approach you seem to advocate. No taxation without representation is a principle. Wars have been fought to establish that principle. To watch New Zealanders simply consign it to the bin without a second thought is deeply, deeply saddening. No taxation without representation is a principle. I call BS! That principle only applies to citizens or countrymen. Your call is your opinion. The principle of no taxation without representation has been won in blood. It is too important to be squandered in the pursuit of political expediency. Once you start down the slippery slope of adapting your principles to fit the fad of the moment, you are running some very serious governance risks. Wars have been fought to establish that principle. So if a war is fought to establish a principle then that principle is right? Can you see how that is not a very compelling argument? In fact it is not even an argument at all. Let me guess: you have no problem with foreigners coming here, buying up large, making mega profits from speculating on property and then not paying any tax at all. I admire the enthusiasm with which you try to put words in my mouth. However your guess is wrong. Nor does it follow from the principle of no taxation without representation. As for your childish chant of "hypocrite"? You are entitled to your opinion. Every tourist who puts money over a counter in NZ pays tax, GST. They should be able to vote?? Why not? They are contributing to the country, aren't they? Where would you draw the line, Pocket? At citizenship and/or permanent residency. Non humans (ie corporations) could not vote. Seems reasonable to me. I never imagined that non-people would ever get the vote. One point though. Citizens, no problem, permanent residents, OK. Non-resident citizens? Maybe a citizen/residency combination of some sort, clarified by an IRD number and payment of income tax, perhaps? No definitely not, there are many people who pay no tax other than GST, should they be excluded, I think you can take the no taxation without representation schtick too far, frankly, and I think you are straying into a no representation without taxation territory. So are you saying under 18s should not be taxed? I think only citizen and PR are able to vote not student and work permit holders. LINZ data used by national is manipulation of data which by now everyone knows. Forigners are all peopke who have registered for IRD from overseas (whuch national claims as foreignef) but also people on student, work visa and anyother short term visa. By defination world over anyone who is not citizen and resident(Permanent residence) are overseas buyer/ forigner butnational lie had been succesful in confusing many as to the defination of foreign / overseas buyer. Can check recent tax imposed on foreigners by Australia and Canada. John Key too will introduce tlax on foreigners as he too knows is required and people want so would be near to election. No way he can avoid but is only delaying as much as possible to please his rich friends and overseas masters as it is them whom he represt and work for. I think you're wrong. Tax resident does not mean permanent resident. They will be beaten if we can get the elderly up to speed with the damage being done to the future of young New Zealanders. Also we need to get out the vote amongst those that are most effected, those who don't vote in the high %. The young, students, ethnics, minorities, potential FHBs, unemployed, Maori, Polynesians etc. With these voting in higher percentages I am sure the Nats are on the ropes. Have you ever wondered why the Nats have discouraged talk on compulsory voting? At the last election the Nats only had to get 39% of the possible votes to win as only 76% voted. In the 18-29 age group only 62% voted. Of Maori only 68% voted. In Oz where it is compulsory 94% voted. There's a reason why NZ First is enjoy good polling at the moment. And they will be getting my vote for sure. It's crazy to force people to vote. If someone feels they cannot make a sensible decision or simply cannot be bothered do we really want their input? Also if people are happy with things as they are or don't mind who is in government why should they need to vote? It is always the left leaning people who feel a need to force people to vote. "In Oz where it is compulsory 94% voted." Only compulsory if you're on the role. If you've never voted you're not on the role. It's only compulsory after you've voted once. In the meantime in places like Tokoroa there is plenty of housing slowly rotting to bits. Those that own them have no hope of doing fixups as it is too expensive for many of the population. A decent forward thinking government would see the need and put people to work. Instead towns like Toke, Putaruru, Kaitaia, Kaikohe TeKuiti are left to rot as the old the young the out of work cant afford house maintenance. We need crews of builders painters electricians and plumbers. Government is in sleep walking mode. These rural towns need help. We need young people learning the trades. Cant they put 2 and 2 together. Walk around the suburbs and you can spot the rentals. So much for 'property maintnance' agents. Am pleased to see some serious renovation work being done on a 70s house nearby (by an older man on his own too). Yes it is a lot of work to bring things up to the best standard, but at least back in the seventies people were working and we had the hope of things being within reach with effort and patience. Despair is just so destructive. It will soon get to the point of no return. More will become unfixable. Then what happens to those that live there. Mr Key wake up. Hundreds of thousands of homes need immediate attention. What a waste of a resource. "the market is building big houses with almost as many bathrooms as bedrooms"
Does it reflect a New Zealand aversion to flush toilets and to washing? I have been in NZ 18 years and have met many many people who in the past have built their own homes here. It is not hard to do but takes hard work and commitment in the evenings and weekends. , it really is very easy to do and saves heaps of money. Agreed. But that would require brains and work. Something seriously lacking in younger folk these days. Let's be honest. Free to build your own home? Sorry but despite what you have been told the reality is somewhat different. The licenced building practitioner regime as administered by your local council is an impenetrable jungle requiring producer statements from ditch digger to designer. They will simply not sign off on your house without them. You theoretically could get a builder and sub trades to sign the P.S.s for you, good luck with that as they have now accepted responsibility for your handiwork for decades to come. Along with the collusion of the banks and insurance companies we are now effectively trapped. If you want your house to be legal, insured or to serve as loan collateral you can pretty much forget about the do-it yourself option. My Dad and I built my first house back in the early eighties, good quality weatherboard two bedder for $25K+ $9K for the section, all legal and insured. Although we were paying 20%+ interest rates, it was a great start and would have been around $50K all up if we paid a builder to do it.Those days are gone - if you can't or won't fit in with the council control freaks and their sidekicks in finance and insurance you are stuffed, probably even a criminal in this country. Very much a "devil in the detail" proposition these days. Yes, you can do it - but. So Auckland apparently has a 40000- 80000 shortage of property , according to whatever household numeric is chosen.We have swathes of empty properties due to offshore purchasers happy to leave the property untenanted . We have historically high immigration , apparently all heading for Auckland, where building consents apparently cannot keep up with the demand . In the past year, as of August 1, median rent for a three bedroom( the most common rental ) Auckland home has risen by 10 dollars a week , two lattes. Thats an annualised 1.68 percent, whereas the median house price has risen by 12.16 percent. or 7.2 times quicker. Alternatively an investor has been willing to spend an extra 60000- 100000 ( borrow interest only ) in the past year to return $520 gross. Again, the mistake is to imagine the ramp-up in builds is possible with existing methods (assembled on site, in the weather, using indifferently trained and occasionally drug-tested hammer-hands yada yada - y'all have heard this sad refrain before). National multiple-use approvals for designs. See Sec 30A-H BA 2004. This cuts local BCA's out from all their meddling, leaving only founds and location within a site envelope to be haggled over. Guaranteed work for those factories. Volume is needed to tool up and keep throughhput high. No use relying on thousands of individual contracts, each buyer seeking their Dream Hoose. This most probably indicated Gubmint contracts and social housing. Lowering buyer expectations. Your master bedroom has no ensuite, Loo's a short walk down the hall. Boo-hoo. Design statement is simple: fast, cheap, warm, small. The problem with multiple use dwellings is that we don't have very many level sites in Auckland. Unique terrain often requires unique designs. Winston Peter best chance ever will be next election. Brexit and Donaĺd Trump can happen because of changing environment and sicial media. Yep keeping your powder dry since 1978 is really going to pay off for him. I was just thinking the other day we need some who isn't a baby boomer to lead NZ and WP being born in WW2 ticks that box. I always wondered why don;t we designate an area in Auckland ( wherever) to build a big hub of nice high rise condominiums 20 -30 stories and make better use of the land ... a place like Hobsonville would have been great if allowed to go up by double what it did now - that would have instantly solved the 5000 -10000 units we are after ... some of these went under 600k .... most now are more expensive now !!! but i am certain they would have cost less if they were in a nice high rise. And that's the best we can do, high density, apartments or otherwise, on the fringe at still unaffordable prices? The more we keep doing the wrong thing, the more we will keep getting the wrong result. Pointing out issues is now being a bigot apparently. Stop trying to hide the conversation, people are becoming awake. I've reread the comments and can't really see anything that is bigoted or even particularly xenophobic although I have always considered a degree of xenophobia to be rational. Who isn't wary of large numbers of strange people behaving strangely? Is the comment a reaction to the discussion about taxation and representation? All people who pay taxes get something in return and it need not be representation which actually implies power. It would be more sensible to say no taxation without some sort of service or favour in return and you usually cannot demand taxes if the tax payer is not getting something anyway. This isn't the Bronze age where we demand tribute but even then tribute generally paid for the security infrastructure. The tax on tea in 1776 ( where the taxation/representation debate originated) was a pretty mild one and the Crown no doubt thought it was supplying quite a lot of services to the colonies. It is also well known that the American revolution was more about the Crown's attempt to protect native lands from colonist expansion further West and the resistance to a tea tax was just an excuse. people that calls others racist or xenophobia to try to shut do the debate, know they are losing and the swing is against them. I would like to think you are correct, but the sad fact is too many people hide behind the "migration debate" (a genuine issue that needs disussing) with ugly views that are given permission to be aired by the Trump and EU/Brexit movements. These sometimes show racisim, xenophobia and migrant-bashing lurking in many people's heads just looking for an excuse to tumble out. I am not going to moderate convesations here any less just because it is a fad to slag off others only because they are culturally different. Even for "a lot of the NZ population". Feeling economicaly threatened is no excuse for bad behaviour. It might be a reason, but it is a bad one. I don't really understand why culture is off limits. I can understand colour of skin or physical traits being off limits to criticism on this forum. Surely some cultural practices are rightfully repugnant to many people. Certain things don't have to be all that extreme either. For example in many places in the world it is acceptable to get away with anything you can get away with. We refer to these societies as low trust or having high corruption. High trust societies, on the other hand, pride themselves in generally doing the right thing even when no one is looking or not taking advantage of things that were put in place for a good reason only for people who need it. It seems to me that this should be open to debate as there are some very good economic reasons for developing a high trust society that newcomers or young people may simply not be aware of. Not often I agree with you Zack when I read your comments, but this one is absolutely on point. There is an economic cost in high-corruption societies, and that stems from the need to verify (to a greater or lesser extent) every transaction, and the need to mop up when you inevitably get ripped off at some point. I suppose it's analogous to HTTP vs HTTPS: HTTPS is slightly slower because every initial contact with a website needs to be verified by comparing certificates and their issuing authorities, and that adds milliseconds to an internet connection, but they add up. That's also why interpersonal connections (e.g. guanxi in Chinese, being enchufado or 'plugged in' in Spanish countries) are so important -- they reduce the cost of transactions because you get to build trust with the counterparty and so don't have to verify everything all the time. High trust is an intangible but extremely valuable thing, and once it's gone, it's very hard to get back. Well said David. Too many trolls hide behind internet anonymity. If you want to express an opinion, have the courage of your convictions. I totally disagree. It has been a long standing tradition in our society to write anonymously. People like Jonathan Swift, for example, published pamphlets anonymously. Calls to end anonymity are usually just attempts to attack annoying people directly and censor them or worse. Would it be racist to say that an old peoples home just for Chinese would be racist? "Chinese community leader Susan Zhu said many Chinese elderly faced loneliness, isolation and language difficulties. "One solution is to have culturally appropriate rest homes, and the need has become even more pressing with this revelation of low home ownership rates," Zhu said." "The older Asian migrants are really dependent on their children, and there is a small number who are being left here to fend for themselves after their children move back to their home country or somewhere else," Ho said." Bring the grand folk over, get them to look after the little princes then the in-betweeners head back home, bolt hole safely secured and no one is paying any taxes to NZ and we have to care for the elderly to the end- oh the follies of NZ immigration. A 2013 Official Information Act release revealed that nearly 3000 migrants who brought their parents here, 31 per cent from China, had permanently left New Zealand. That's worse than being left holding the baby when you think about it. Seems wrong doesn't it or is that just my cultural bigotry bubbling up? Did they take their parents with them? Or did they dump them here? It seems a bit harsh to say "dumped". It's more like leaving them with the kindhearted Elven folk who care for them in their autumn years. I can tell from your comment Mr Murray86 that you find this astonishing and barely believable. I bet you couldn't even approach such a place without shielding. The vibrancy would be too intense. My ailing father who was English (Red Nordic) spent a couple of weeks at a Dutch retirement home in Te Atatu South. It was really nice there. "few overseas-born elderly Asians own a house - many living in poor conditions"
For goodness sake BH do you not know what happened after those stupid policies were implemented in the 1970's?? It is Government intervention at every level that causes all the issues in the free market and you know it yet here you go again writing expressing your desire for more intervention.....why not do some balanced reporting from time to time instead of using interest.co.nz for putting out your political messages? Gotta love the "culturally appropriate"
"PrefabNZ CEO Pamela Bell said the size and cost of new houses is now driven by developers looking to maximise profit margins at the lowest risk from their sections, which means building for the top end of the market on expensive sections. Along with often restrictive covenants requiring large floor plans, the market has moved to mostly building big houses with as almost many bathrooms as bedrooms, she said. "It's supply driven by developers looking to make the most of their land," Bell said." exactly.. the results of no government interference , free market for he good of the market not the people. So would one want a solid low maintenance 100+ sq home most now have closed decks , built on over the last 45 yrs on a 640 sq meter section with 2x garage. place children play.. fully fenced for high 500 Ks or a new 140 sq m on 200 sq meter section for $850 to $950K up the road? And why cant they build along these lines.. the lines it has been done over he last 150 yrs when immigration/ housing shortages have rolled around? Oh yeah a Government system on one hand now tied to market forces/ hands off.....and politicians with no balls enough to make the radical changes required for the modern world.. and tied to/ controlled a self sustaining bureaucracy. Comfortable, low cost and reviewed regularly for improvements. Plans distributed free of course...councils assured it is all OK.
"No taxation without representation" was fought and won long before the days of income tax and GST. Taxes back then pretty much consisted of property and/or the odd wealth tax. I built my first home in 1973 and my wife and I are still living in it so I think I could claim to have some knowledge of 1974. At the same time I was doing demographic analysis for Telecom. At that time there was a terrible shortage of rental properties. So suddenly there was a sudden burst of building of small rental properties. Years later on, many of those blocks of multi unit flats got split up into separate ownership owner occupier flats. These days the councils and central government are discouraging building small rental investment flats so surprise the bulk of new dwellings are 200m +. This is not an accident it is deliberate government policy. Why are the politicians so surprised when their policies work.